Appearance: Tan resin, vacuform canopy, small decal sheet and double-sided instruction sheet. A twin-jet powered airplane with twin booms? 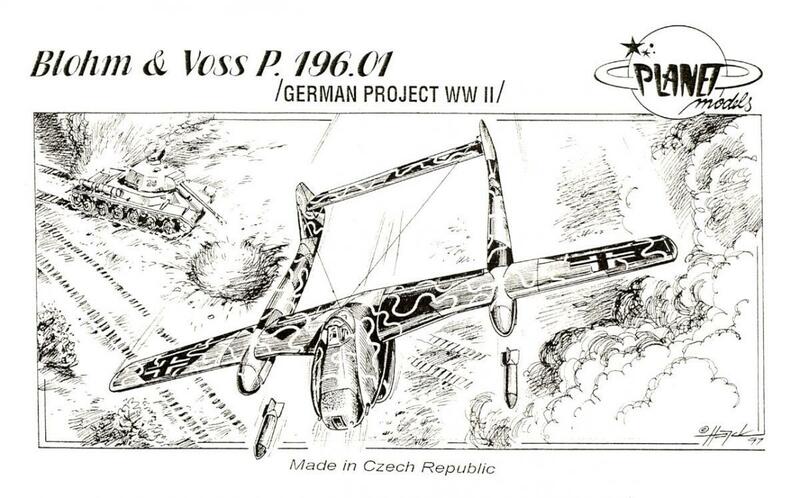 No it’s not the Vixen, but another late war project from the shipyards of Blohm & Voss. 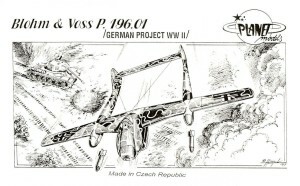 The p.196.01 placed its’ twin jets underneath the center fuselage pod and a bomb bay in each of the booms. One can only wonder about the debris damage to the horizontal stabilizer during takeoffs and landings. 1) The center wing section is cast as a single integral piece with the twin booms, vertical fins/rudders and horizontal stabilizer. This solves virtually all alignment problems inherent in twin boom aircraft. Add the outer wing panels, maintaining the dihedral and you’re three quarters of the way home. 2) The lower fuselage pod has to have the jet engine faces and exhausts added, along with the front and rear engine covers. Some filling and sanding are needed. This is glued to the bottom of the wing. 3) A floor with side consoles is provided. Add a seat harness to the seat, glue the control stick and add the floor to the bottom pod. 4) The upper pod gets the instrument panel, which is poorly done and best replaced by either a decal or an aftermarket resin panel. This upper pod half is matched & glued to the lower pod and wing. To be honest, and it’s probably my fault, I thought the fit could’ve been better. As always, sand and fill as necessary. 5) Flip your model on it’s back and decide if you want open or closed bomb bays. I left mine open to show off this unique feature. Glue fill and sand the nose cap. 6) Fortunately there is a little detail in the landing gear wells, but feel free to add more. The landing gear doors need to be cut apart for a gear down configuration. The wheels are shown to fit on small rods, which are glued to the landing gear legs. Forget it and just glue the wheels directly to the legs. Add the two tail wheels and their doors as well. 7) As usual, you only have one shot with the vacuform canopy. Cut and Futurize it prior to fitting and add after painting and decaling. The color scheme given is RLM 65 undersides with a hard splinter of RLM 70 and 71. To this is added an overall “squiggle” of RLM 76. The nose cap and underwing tips are RLM 27. I followed this scheme (except for the squiggle). The decals are delicate, with a tendency to either fold or stick firmly. As usual, the tail markings are those triply damned, politically correct swastikas..
Summary: As always, Planet Models provides us with an easily built and striking model. I’ve been told that if you want to start on a resin kit, go to Planet. I couldn’t agree more! Considering how weird and wonderful most Luftwaffe “dream machines” looked, this one has a pleasingly “normal” appearance! I recommend it to almost any modeler.